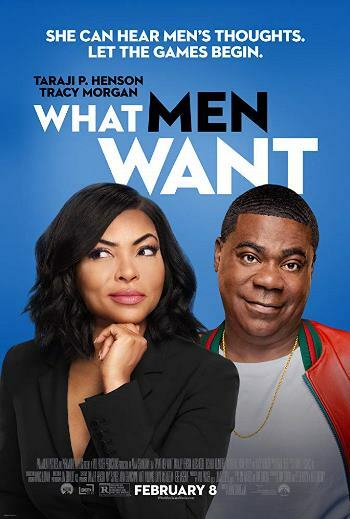 Starring Taraji P. Henson, Tracy Morgan, Richard Roundtree, Aldis Hodge, Max Greenfield, Wendi McLendon-Covey, Josh Brener, Tamala Jones, Phoebe Robinson, Jason Jones, Brian Bosworth, Chris Witaske, Erykah Badu, Kellan Lutz, Shaquille O’Neal, Grant Hill, Karl-Anthony Towns, Pete Davidson, Mark Cuban, Auston Jon Moore and Shane Paul McGhie. Distributed by Paramount Pictures. 117 minutes. Rated R.
I find it hard to believe that anyone has really been sitting around waiting for a reboot of Nancy Meyers’ perfectly pleasant but mostly forgotten 2000 rom-com What Women Want. The original film starred Mel Gibson (soon before his bad life choices ended his ability to pull off a romantic hero). Gibson played a sexist advertising exec who suddenly gets the gift – or curse – of being able to read women’s minds. And through this ability, he mostly learned what they thought of him. At first, he tried to use the new skill to manipulate women, but eventually he acknowledged their opinions and tried to better himself. It was a sweet, slight movie, a fairly large hit at the time that has since been pretty much forgotten because the reputation of its star was pretty much sullied beyond repair by his alcoholism, bigotry and violence a few years later. So why, not even 20 years later, remake the movie? Why flip the switch on the gimmick, changing it into a woman who can hear men’s thoughts? And why change the lead character to an African-American? Who knows, but like the original, What Men Want is slight-but-pleasant, and it does take on a bit more edge in the new win-at-all costs corporate world, and in the #MeToo generation. It is also very funny. Surprisingly funny. Credit where it is due, this movie is a lot better than we had any right to expect. Good for them for making a movie that was probably not something most people would be waiting for, and then have us wonder why we weren’t waiting for it to come. I cannot stress this enough: What Men Want is not a great movie, but it is a very, very enjoyable one. That’s really all it was ever really aiming at. So, job well done. Taraji P. Henson takes the lead, now a woman (and a black woman at that) in the boys’ club of big-time sports agents. Ali is the only daughter of a tough boxing manager (it’s great to see Richard Roundtree again) who has learned that the only way to make it in a man’s world is to be even tougher than the guys. However, she keeps hitting glass ceilings and having less talented agents promoted above her. When she gets the power to read men’s minds (I won’t even bother to explain how, it’s way too convoluted) Ali uses it to finally make a power grab, promising the whole staff that she will sign the anticipated top draft pick for the NBA. The kid is a sweet, thoughtful guy, but his oddball dad (Tracy Morgan) makes it a difficult job. Of course, through her new power, she learns to open herself up, climb the ladder in the company, open herself up to be a woman and even find the possibility of true love. It is all played very broadly, but that doesn’t matter. You’ll laugh. And really, that’s one of the things that men want. Tags: #metoo, Adam Shankman, Aldis Hodge, Auston Jon Moore, Brian Bosworth, Chris Witaske, Erykah Badu, Grant Hill, Jason Jones, Jay S. Jacobs, Josh Brener, Karl-Anthony Towns, Kellan Lutz, Mark Cuban, Max Greenfield, mel gibson, mind-reading, movie review, Nancy Meyers, Pete Davidson, Phoebe Robinson, PopEntertainment.com, remake, Richard Roundtree, Shane Paul McGhie, Shaquille O’Neal, sports agency, Tamala Jones, Taraji P. Henson, Tina Gordon, Tracy Morgan, Wendi McLendon-Covey, What Men Want, What Women Want. Bookmark the permalink.